Drawing 22 shows a section through Taylor's south-east Transfer Office, probably worked up from an earlier sketch, after the demolition of the old office had begun. The longitudinal section (cut along an east-west line) faces the eastern wall. A part of Taylor's south Transfer Office can be seen on the west (left) and the outer wall to the east (right). The section also shows three of the twenty three lanterns (see drawing 9). 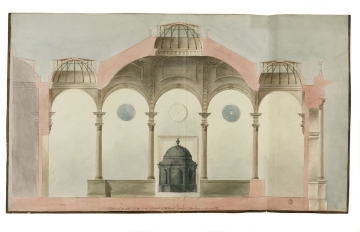 The central lantern includes a row of short fluted pilasters (each capped by an indiscernible moulding) encircling the ring beam beneath the dome. The decorative mouldings differ slightly from those shown in drawing 6: the swags over the three central arches are similar in both halls but the pattern of circles reducing in scale above the columns in drawing 22 differ from the rosette diaper pattern of drawing 6. Beneath the central lantern is an object of sepulchral appearance that may have been the original stove.